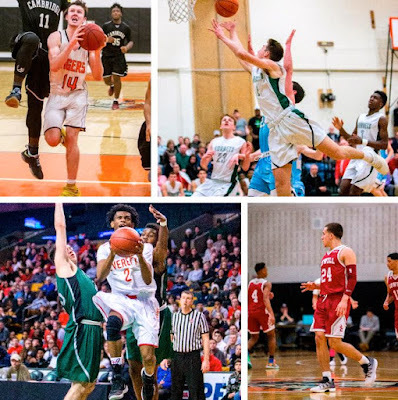 After an MIAA Basketball season that featured a number of breakout stars and sensational performances, SuiteSports is excited to announce this year's Suite 16, our annual MIAA Basketball All-State Team. Shaughnessy followed up a terrific junior season with an equally as impressive senior year. The left-handed shooting guard scored 21 points, dished out five assists, and compiled two steals per game, while becoming the first player in program history to reach the 1,000-point scoring plateau. Behind Shaughnessy, the Rockets won at least 19 games for the second consecutive season. Shaughnessy will continue his playing career at Brown University in the fall. All season long, Rivera proved to be one of the top scorers in Massachusetts. Rivera had range from well beyond the three-point line both off the catch and off the dribble, had a smooth mid-range game, and could finish strong with his off hand. For the season, Rivera averaged 26 points, six rebounds, and five assists per game. Rivera will continue his playing career at the University of Massachusetts Lowell. Coming into the season, Wright was widely considered one of the top talents in Massachusetts. The senior small forward from Newton North did not disappoint, using his length and athleticism to repeatedly throw down game-clinching dunks, while also splashing three pointers. Wright finished his legendary career at Newton North second all-time in scoring with 1,803 career points. On the season he averaged 26 points and seven rebounds per game. Wright will continue his playing career at Princeton University in the fall. The super scorer had an electric end to his high school career. Boyce led the Crimson Tide to their first sectional title since 1994, surpassed the 2,000-point plateau in the state tournament, and became the top scorer in Everett boys’ basketball history. Boyce often saved his best for last, as evidenced by 21-second half points that came against Lawrence in the Division 1 North Final. Throughout the Hornets' run to the Division 1 State championship, McCoy consistently produced at a steady rate, becoming Mansfield’s “go-to” option when in need of a basket. After winning the Hockomock’s Most Valuable Player award, the six-foot-four McCoy followed it up with a solid postseason where he scored 23 points in Mansfield’s South final win over Brockton, before pouring in 19 points in the state final. For the season, McCoy averaged 19 points and seven rebounds per game. The small forward plans to attend the Tilton School in the fall. As a junior, Reynoso was the co-MVP of the Merrimack Valley Conference, while leading Lawrence to a 21-3 record and a spot in the Division 1 North Final. Dew-Hollis was sensational throughout the postseason for the Bears, proving to be the catalyst for nearly every TechBoston surge. Williams' was one of the top shooters in Massachusetts this season, especially from beyond the three-point line. The Bulldogs' junior guard finished with 128 made three-pointers. While only a sophomore, Edgehill showed flashes of superstardom as he led Franklin to a second straight state championship appearance. Edgehill scored 17 points to go with five assists per game for the Panthers. The six-foot-six Korte showcased his full array of talents in his senior year. In leading Watertown to a state championship, Korte poured in 21 points and hauled in nine rebounds per game. For the second straight year, Evee was a focal point of the Eagles’ offense, and responded with big-time production. Evee averaged 22 points on 42-percent shooting for the season. Throughout the season, Henderson was one of the premiere shooters in Central Mass. scoring 21.6 points per game, including a 36-point performance against St. John's (Shrewsbury) in the Division 1 Central semi-final, to lead Algonquin to a sectional final berth. Yardemian was one of Massachusetts' most notable breakout stars as he scored 23 points per game while averaging seven assists to power the Marauders. A gifted scorer who also kept his teammates involved, Works was one of the MIAA's most complete offensive guards, but also used his quick hands to pile up steals on the defensive end. It's hard to see TechBoston completing its dominant run through the D2 state tournament without him. Lowther was at the heart of what was a historic season for the Hingham boys’ basketball program. The junior forward averaged a double-double, putting up 16 points and 10 rebounds per game. The six-foot-nine Ward burst onto the scene this season, showcasing incredible shot-blocking capabilities. The scary part is that he's just scratching the surface of his potential offensively, and may already be the best big in the MIAA. I think its comical that Rivaldo Soares is Honorable Mention. The kid just received Boston Herald and Globe All-Scholastics for the second year in a row! How many kids on the 1st, 2nd, 3rd team All-State received that?? This list only has kids who went to the North and South Finals of States primarily. He is clearly one of the best players in the state averaging 20ppg, 5.5 assists, 13 rebounds per game. As a 6'5"guard he so versatile and can guard positions 1 thru 5 and on offensive its a mismatch every night vs any opponent. In high school you dont see many kids who dunk on people, shoot threes, and handle the ball very well, and are great passers.